Nothing like a hefty German Princessling becoming empress of Russia! Talk about upward mobility. Sophie Friederike Auguste, Prinzessin (princess) von Anhalt-Zerbst (1729-96) really lucked out with her arranged marriage to Peter III (1728-1762), too bad for her sake he turned out to be close to a raving lunatic, but she overcame that. Peter III, who had been raised in Germany, had been proclaimed as the heir to the Russian throne by his aunt, Empress Elizabeth in 1742. She also arranged the marriage between Peter III and Sophie--who took the Russian name of Ekaterina (Catherine) when she converted to Russian Orthodoxy--in 1745. On the death of Elizabeth in December 1761, Peter III became tsar and proceeded to issue a number of reform decrees including the release of the nobility from Peter's decree of compulsory state service, but his pro-Prussian policies brought him a lot of discontent. On 28 June 1762, he was overthrown in a coup led by Catherine, and he was killed a few days later (7 July 1762) by Count Alexei Orlov, Catherine's favorite and one of the organizers of the coup. Anyway I would rather include a few remarks about Pugachev, whose name was enough to strike fear in the hearts of the tsars (and even the later Soviet leaders). just did not photograph very well! 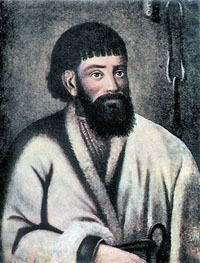 Emelian Pugachev (1742?-1775) was the leader of what became known as Pugachev's Rebellion (the Pugachevshchina, or loosely translated as the "very bad things done by the rebel Pugachev") in 1773-74, the most dangerous revolt ever against the Romanov dynasty. Any exact details of Pugachev's early years are probably lost forever to history, but it is clear that he was an illiterate Don Cossack who had participated in the Russian army during the Seven Years War, which gave him some exposure to military affairs and Russian authority. Pugachev turned out to be an extremely charismatic figure, and after his military service he wandered for some years in the Ural-Volga-Don region. Pugachev claimed to be Peter III (1728-1762), who had been killed as part of Catherine's coup d'état. According to Pugachev, he had secretly escaped assassination and now he was going to raise a rebellion to overthrow Catherine and restore himself to the throne; Pugachev was acting in the long Russian tradition of "pretenders" to the throne. His words found fertile ground among the frontier Cossacks who resented the increasing inroads of imperial state power and also the peasants who had become further and further enserfed under the Romanov dynasty (not to mention the heavier and heavier tax and military obligations). So disaffected peasants, frontier cossacks and also Turkic and Bashkir minorities proved to be the three components of the rebellion. The first manifesto of revolt appeared in September 1773, and quickly the rebellion spread throughout the Urals and along the Volga. This was at the same time that Russia was finishing up a war with Turkey so there were limited troops available to deal with the rebels. Besides, at first Catherine and her court refused to take the rebellion seriously. Pugachev, in the meantime, created a fairly substantial bureaucracy, court structure and raised his army. He issued manifestos promising to give peasants land and grain and to lower taxes. He was especially successful in using village priests as his intermediaries to the peasants. But Pugachev's good times were not going to last. In August 1774 the rebel army suffered a crushing defeat near Tsaritsyn (Stalingrad/Volgograd), and throughout the rebellious region, the tsarist government enacted savage reprisals. In September 1774, Pugachev's own friends--in an effort to save their heads--delivered Pugachev to the imperial authorities. Aleksandr Suvorov had him placed in a metal cage and transported to Moscow for public display. Public execution (beheaded and then quartered), took place on 10/21 January 1775. Talk about the slender thread of history. In an effort to wipe out all vestiges of the revolt, Catherine had the names of Pugachev's village, his cossacks, the local river and other localities renamed. It is a bit unclear of the further historical impact of what Pugachev had done. Certainly from that time forward, Russian rulers were always conscious of how dangerous a peasant rebellion could be for Russia--The Russian nobility was even more conscious of the danger! The tsars also remained even more firmly convinced after Pugachev that only a strong autocracy could rule Russian and keep in check the "dark" forces of the Russian peasantry. So, the "Pugachev Revolt" became one of the major defining milestones of Russian history along with such other events at the Mongol "Yoke," the "Time of Troubles," "Peter the Great." Finally, let me just mention that Catherine was responsible for creating the first real, Russian art musuem--though the work that she collected was primarily West European--the Hermitage. Gavriil Derzhavin, Poetic Works, translated by Alexander Levitsky and Martha Kitchen (2001). See his portrait. Some lectures by the late Professor Michael Boro Petrovich are available on the web: 18th Century Russia, Catherine the Great, and Nobles and Serfs in Russia. 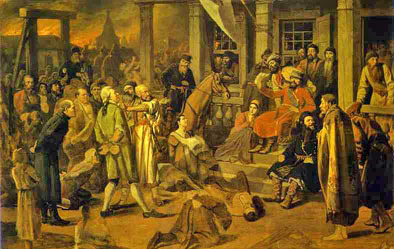 The Pugachev Rebellion was the most serious threat to Russia during the reign of Catherine, but there is not much online dealing with the rebellion. You can read Professor Rempel's lecture Catherine and Pugachev. There are also some limited documents from Pugachev. If you are interested, you can check my remarks on Moscow University during the reign on Catherine, Chapter 2 of my dissertation. Some interesting remarks about the reign came from Prince Mikhaylo Shcherbatov (1733-1790), On the Corruption of Manners in Russia (This is only a very small excerpt), and a letter from the English ambassador, written in 1778, containing impressions of Catherine II. A longish account is available at members.tripod.com/~Nevermore/CGREAT.HTM. Probably the most important document of Catherine's reign was actually issued by her husband, who was conveniently murdered so that Catherine could ascend the throne, Peter III's Manifesto Freeing Nobles from Obligatory Service (1762). The Princess who Became Catherine the Great is an easy-to-read account of Catherine's reign by an amateur historian; not bad at all. PBS series on Catherine is on Youtube: part 1, part 2, part 3, part 4, part 5. Finally, have a look at three portraits of Catherine.